Inside Fuji's first compact system camera (CSC), the Fuji X-Pro1, is a 16.3 million pixel X-Trans CMOS that produces images of up to 15.89MP. This means that when images are printed at 300ppi, they are just a small fraction short of full A3 size - ideal for most enthusiast photographers. Although this sensor is APS-C sized, Fuji claims that its cunning design enables the XPro1 to produce images that are superior to a full-frame camera's. The secret is in the arrangement of the pixels. Unlike most cameras that use a Bayer pattern of red, green, green and blue receptors (usually referred to as RGGB) arranged in a 2 x 2 grid, the X-Trans CMOS device uses a 6 x 6 RGGB filter array pattern, with a random arrangement of colour filters within each block of 36 photo receptors. Fuji claims this avoids the issue of moiré patterning, which can occur as a result of the fine grid structure that makes up the average Bayer pattern sensor. As a result, the Fuji XPro1 isn't fitted with an anti-aliasing filter, which means it should be able to produce sharper images from the outset. 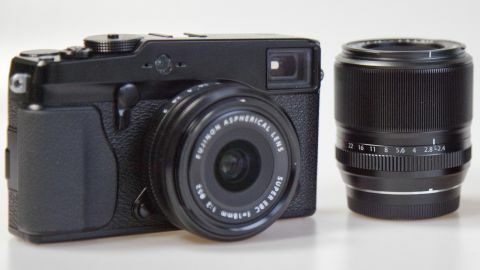 The Fuji X-Pro1 is the brand's first interchangeable lens camera since the Fuji FinePix S5 Pro, which dates from September 2006. While the S5 Pro is a DSLR that accepts Nikon F-mount lenses, the Fuji X-Pro1 is a compact system camera debuting Fuji's X mount. To coincide with the release of the X-Pro1, Fuji has introduced three compatible XF lenses; the Fujinon XF 18mm f/2 R, XF 35mm f/1.4 R and XF 60mm f/2.4 R Macro, these have a focal length equivalent to 27mm, 53mm and 91mm optics on a full-frame camera. Traditionalists will love the fact that each of these lenses has an aperture ring for adjusting exposure. Similarly, the top plate of the camera has a shutter speed dial to set the shutter speed in whole stops running from 1/4000 to 1 second. There are also Time and Bulb options on the shutter speed dial, with the first enabling exposure to be set to 2-30sec in steps of 1/3EV and the latter enabling manually timed exposures up to 60 minutes. Both the aperture lens rings and the shutter speed dial have an A (Automatic) setting. Setting both to A puts the camera in program mode, while setting only one or the other to A selects aperture or shutter priority mode. There are no scene modes, but the Fuji X-Pro1 isn't designed to attract novice photographers who need to use them. In manual exposure mode (when the photographer sets both dials to anything other than A), the correct exposure can be judged using the scale on the left side of the viewfinder and LCD. In other modes this scale indicates the exposure compensation. As a compact system camera, the Fuji X-Pro1 has no reflex mirror to bounce light into the viewfinder, but, like the Fuji FinePix X100, it has a hybrid viewfinder that combines a direct optical viewfinder (OVF) with an electronic viewfinder (EVF). A small lever on the front of the camera enables the user to switch between the two finders - more of these later. Images may also be composed on the 3-inch 1,230,000-dot LCD screen on the back of the camera. This is one of the highest resolution camera screens around, but unlike the units on many recent CSCs, it's not touch-sensitive. Another consequence of there being no mirror in the Fuji X-Pro1 is that it has a contrast detection autofocus system rather than a phase detection system. There are a total of 49 individually selectable AF points arranged in a 7 x 7 grid across the image frame. Helpfully, the size of these points can be quickly adjusted (there are five options) using the command dial near the thumb rest, so if you need more precision it takes just a second or two to achieve it. Fujifilm has a history of making film, so it's hardly surprising that the company is underlining this in its latest camera in the form of Film Simulation modes. In total there are 10 of these modes, with names such as Provia (the standard JPEG setting), Velvia, Astia, Pro Neg H and Pro Neg S ringing bells with photographers who started shooting on film. No CSC would be complete without video technology, and the Fuji X-Pro1 can shoot Full HD (1920 x 1080pixels) movies up to 29 minutes long at 24fps and with stereo sound. While in many ways the Fuji X-Pro1 looks and feels like a traditional rangefinder camera with the addition of an LCD screen, it has just about all the features you respect from a modern digital camera. These include a virtual horizon display to help keep shots level, plenty of control over white balance, a range of bracketing options, dynamic range optimisation settings and a motion panorama mode. The only really noticeable absence is a built-in flash, but there is a hotshoe to accept flashguns such as Fuji's EF-20 TTL or the larger EF-42 TTL.